Goalkeeper Mark Howard was delighted to mark his return from injury with match-winning saves – one from the penalty spot – as Blackpool bolstered their play-off hopes with a vital 2-0 home win over Walsall. 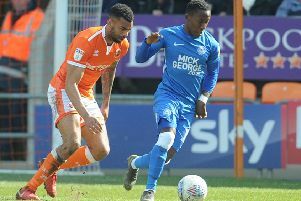 READ MORE: Do Blackpool face play-off battle or relegation scrap? Pool’s number one has spent five weeks on the sidelines with a groin injury picked up in the FA Cup defeat by Arsenal. Despite stand-in Christoffer Mafoumbi’s good form, manager Terry McPhillips opted to bring Howard back to face the Saddlers and it paid dividends, the 32-year-old keeper turning in a man-of-the- match display. “It’s obviously nice to be back,” Howard said. “It was frustrating being out for a couple of weeks but it was just one of those things. “I needed to rest it up properly and I think the game being called off last weekend (at Accrington) probably did me favour by giving me an extra week of full training. Howard enjoyed a quiet first half thanks to Blackpool’s dominance, the Seasiders leading 1-0 at half-time thanks to Chris Long’s early goal. But Pool came under the cosh during the second 45 minutes and were grateful for a couple of outstanding saves from the former Bolton Wanderers keeper. Howard went the right way to save Matt Jarvis’ penalty but a minute later he made an even more impressive stop to deny Aramide Oteh from close range. Blackpool doubled their lead two minutes from time through Harry Pritchard to make the points safe. “I try to do as much homework as I can with the video analysis. I try to know as much as I can,” Howard said of his preparation for penalties. “But I didn’t know where they were going to go apart from Andy Cook and he didn’t take it. “I just had a little read of the player’s body and it’s a guess really. “Luckily enough I dived the right way and that’s all that matters. “Obviously a penalty save is always nice but the second save I will give myself a little bit of credit for. “I didn’t know a lot about it. It was a reaction save and I’ve just managed to get it over the bar. “I’ve tried to stay as big as I can, and luckily enough I’ve reacted well to it and got enough on it to get it over, so I was quite pleased with myself. “I’ve had nothing to do first half because the lads defended brilliantly. Second half I’ve had a bit to do. “We gave them some impetus giving away the penalty and they gained a bit of momentum. “At that point it was difficult for us to get our foot on the game and get out of our half really.